Matte Medium — Create translucent matte effects by mixing this with acrylic paint. Permanent and water-resistant when dry, do not use as final glaze or varnish. Gloss Medium — Mix with acrylic paint for a transparent Gloss finish. Permanent, water-resistant when dry, do not use as final glaze or varnish. 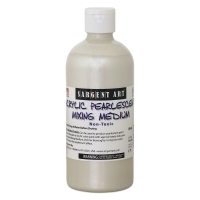 Pearlescent Mixing Medium — Produce pearlescent paint effects by mixing small amounts of acrylic paint with medium-one part acrylic paint to 10 parts Pearlescent Medium.